While today there are many new cutting-edge skin care products and techniques, it is the ancient ones that keep making surprising comebacks. 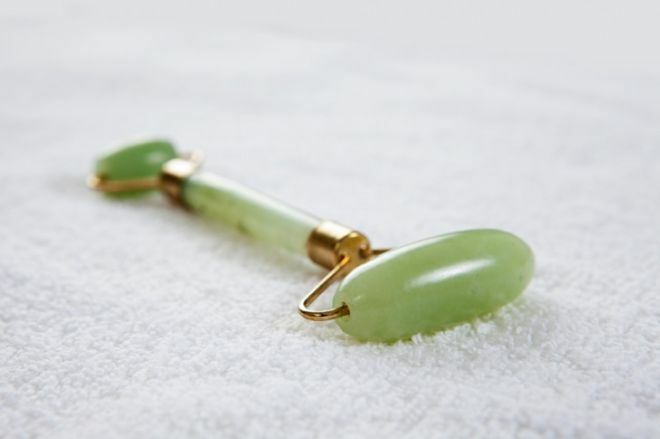 The newest (or oldest) ancient tool to make its way back into the limelight is the jade facial roller. If you’re looking for a way to improve your skin’s overall appearance as well as do some under-the-surface healing, keep reading to learn more about this amazing tool! What is the jade roller and where does it originate from? 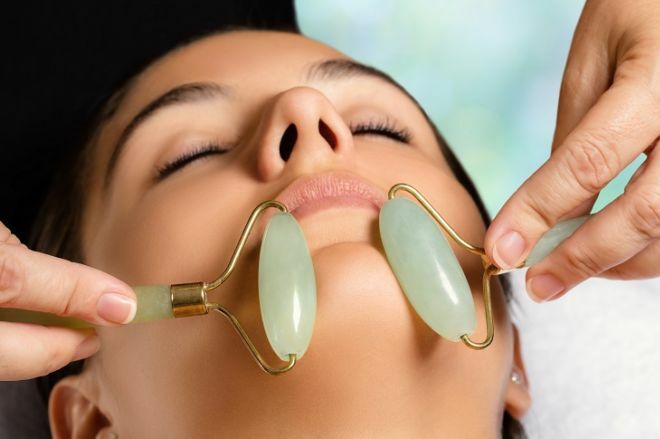 The jade roller is a tool used for facial massage that looks kind of like a paint roller, only instead of the sponge, you’re rolling a solid jade stone along your skin. This amazing tool has been used by the Chinese elite since the 17th century, including empresses. Jade was used in skin care by the Mayans and Egyptians as well because of its naturally cool properties. Jade tends to be a naturally cold stone and as we all know, cool temperatures help reduce swelling and puffiness. Moreover, since rolling the jade across the face is a form of massage, what you’re actually doing is stimulating circulation in the area which improves elasticity and keeps your skin glowing. The massage involved in using jade rollers also helps reduce facial tension and detoxes your skin by promoting lymphatic drainage. Lymphatic drainage reduces swelling as well as helps treat acne because it removes unwanted toxins and skin congestion. Regular lymphatic massage can also help remove dead skin cells thus increasing skin brightness. The massage involved in using jade rollers also helps reduce facial tension which we know can lead to wrinkles. Repeatedly making the same face or wrinkling your forehead can cause more permanent wrinkles to form, and when we are stressed, we usually pinch our faces much more. Therefore, if you’re more relaxed, your face will be more relaxed and you’ll be left with fewer wrinkles! Massaging your skin after applying a serum or moisturizer will help your skin absorb the products better, therefore increasing their effectiveness. The reason for this, according to skin-care advisor Joanna Czech, is “When you press, your skin microscopically stretches and when you release, it grasps [the product] easier.” Furthermore, the coolness of the jade roller will help close your pores effectively trapping the product inside them. The jade roller, while seemingly amazing, isn’t good for all skin types. If you suffer from rosacea or eczema you might want to steer clear since increased circulation is the opposite of what your skin needs. Also, don’t share your jade roller and be sure to wash it with soapy water after each use. Jade is a porous stone and can harbor bacteria if not well taken care of. Before you start using the roller, wash your face and apply a moisturizer and serum. Make sure to roll upwards to create a lifting effect. Also, to make sure you don’t miss any spots, do one side of your face and chest at a time. Your roller comes with two stones, one large – for the neck and face, and one small- for around the eyes and lips. Starting with the larger stone, apply gentle pressure on your chest and move upward. Go over the same patch of skin 3-4 times From your chest move on to your neck, chin, jawline, and cheeks. When you get to your eyes switch over to the smaller stone and gently roll from the inner corner out to your temple. When you reach your eyebrows switch back to the larger stone and roll following the contour of your eyebrow. Continue up to your forehead, starting in the middle and rolling out.